How Do You Find Good Educational Apps? There are a lot of amazing new educational apps out there, whether you're looking for native apps or Web apps, apps for your mobile phone, for your tablet, or for your laptop. There a number of app stores too where you can find and download them: Apple's iTunes and its Mac App Store, the Amazon Appstore, Google's Android Market, the Chrome Web Store, the Google Apps Marketplace, GetJar, and so on. These app stores all offer products in a designated education category, ostensibly designed to make it easier to locate apps for learning and studying (as opposed to apps for productivity or for entertainment, although sometimes these categories do overlap). But having an education category doesn't necessarily make it easier to locate quality apps, as any cursory search there will quickly show you. Apps for teaching pre-schoolers the alphabet are grouped alongside those for studying calculus or human anatomy. Spanish for Beginners flash cards are found next to GRE test preparation. When you're spending money on these apps, those $1.99 charges add up. Take, for example, a look at the educational apps in iTunes. 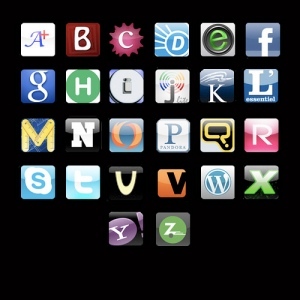 The category highlights the top paid and top free apps, that is, listing them in terms of download and sales numbers. It also features "New and Noteworthy" applications, as well as "Staff Favorites." But these are a wide variety of apps: Shakespeare's Midsummer Night's Dream for your iPhone and an interactive Winnie the Pooh e-book. This problem with very broad categorization exists outside the education category, too. If you search, say, for "science," you'll get some science magazines, some reference apps, and some not-safe-for-work results too. iTunes does offer a ratings system, as do all the major app stores, whereby users can give apps zero to five stars and can write detailed reviews of their experiences with the app. But this too is frequently an unreliable way to discover new and interesting applications. Oftentimes, like websites such as Yelp, those who leave these reviews have either had terrible experiences with the app ("It crashes every time I use it") or rave about it uncritically ("This is my preschooler's favorite app.") Too often, there are so few reviews, it's hard to know whether customers' responses are typical or not. Although sites like the Google Apps Marketplace do try to help the review process by highlighting those tools that have been reviewed by a "Verified User" (in other words, by a real customer rather than a fictitious account created just for the purposes of boosting ratings), these ratings aren't weighted more heavily or any differently than anonymous reviews. An app can have 20 anonymous five-star reviews, and without a closer look, it's easy to mistake that as something better than an app that's got only five reviews, but all from verified accounts. The alternative, of course, to searching through App Stores and taking your best guess based on the review information there is to rely on the recommendation of people you know. Indeed, word-of-mouth remains one of the most important ways that developers can sell and buyers can find quality applications. Several educational blogs write detailed reviews of new educational apps, and sites like Moms With Apps try to showcase "family-friendly" developers' work. And while "caveat emptor" holds true in app purchases as with anything you buy, one has to wonder if there aren't better ways to help showcase quality apps. It's one thing, of course, when the applications are free. If you download a new educational game and you find that it's not fun and not smart, it's easy to simply delete it. But the stakes are higher once you're looking at spending money on these apps (those $1.99 charges add up), particularly since the return policy for app marketplaces is limited: Android apps can be returned within 15 minutes, but iOS apps are non-refundable. Readers, how do you find quality educational apps? What changes would you make to the app stores to give consumers better information, particularly when it comes to educational apps?